Welcome to my monthly series where I share my blog stats and income with you. I was inspired to do this because I know of some bigger bloggers (like Pinch of Yum) who share their blog stats and income but I really didn’t see any smaller bloggers (like me! and maybe you!) who do so. I figured if I was looking for something like this, others might be as well, so I decided that I’d start sharing my monthly stats and income. Here’s my July blog stats and income report – I hope you find this helpful (you can find June’s report here)! As I suspected, July was a bit of an upswing from June. I had some posts take off (read on to hear about my most popular posts in July) and also received some sponsored posts payments for a high income for the month. I posted 20 blog posts in July (as opposed to 15 counting this one in August) and I do find a correlation between posting frequency and views. An interview with local radio personality Sarah Fraser on body image. Five health trends I’m just not into – yep, Crossfit made the list. My announcement that I’m going back to Richmond this fall to race the half marathon. My biggest referrers in July were organic searches (yay, SEO! ), Facebook and Pinterest. I’ve been sharing most of my blog posts on my personal Facebook page and that has helped to get more of my friends who might not follow my blog but might be interested in a post or two to check it out. July was when I switched from posting 5 days a week to posting 3/4 and so my traffic does start to die down a bit towards the end of the month. August is so far a bit down from July both in page views but also in income. I’m still hoping to get some fun things in place here on the blog before the year is out. However, with my travel, work ramping up and general life stuff, I’ve been a bit overwhelmed and when that happens the thing that has to give is blog improvements. I am hoping I can take a couple of days over the next month or so and devote it to blog stuff – wouldn’t that be the dream! 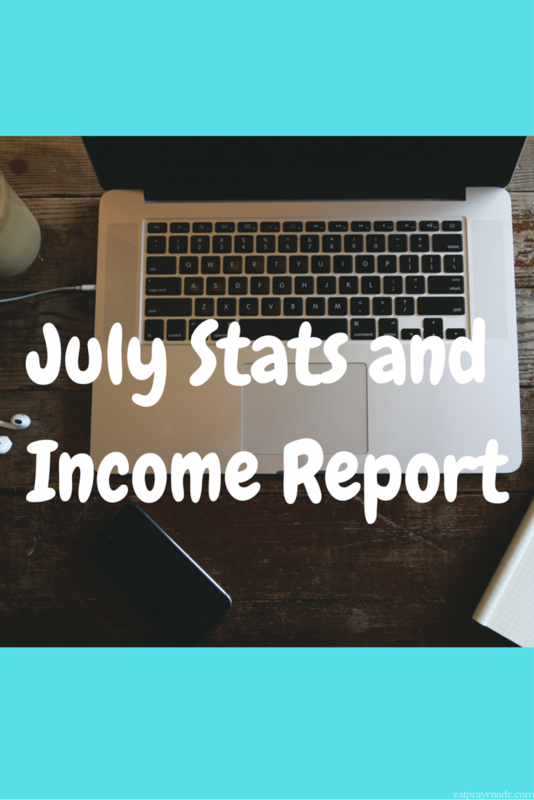 Be sure to come back next month for August’s blog stats and income report! What is your biggest traffic referrer? I noticed you said you started sharing your posts on your personal page. I have not done that yet but perhaps I should! Deborah @ Confessions of a Mother Runner recently posted…August Bulu Box-What’s Inside? It definitely increases traffic to my blog! That’s interesting to hear about Facebook. I usually assume that my friends wouldn’t be interested in my blog, but maybe I”m wrong. I don’t share my posts on my personal page. I think my friends get tired of my running posts, which is why I started my page. When I share my posts on a public page, like FiTfluential, I think they can see it, right? Thanks for sharing all this. It helps me. I’m kind of stuck, tho. I have really great engagement, and decent page views, but not like the big bloggers. I finally got that Bulu Box campaign from SweatPink. Oh well, I’ll just keep writing, because that’s why I started the blog in the first place! Thanks – and for some frame of reference, my pageviews have increased by over 100% from this time last year. Great job as usual lady!! I love reading these, kind of gives me an idea of where I’m at! I share posts once a month or so on my Facebook. Anything that is relevant to my personal friends. My friends that are interested just follow my training on my blog Facebook page! It sounds like it was a really good month for you! Thanks Courtney! I also always share on my personal page…I’ve realized (because they’ve told me!) that they are really interested in my posts and love reading my blog…so you never know! My biggest increase in page views this month has come from Pinterest and I’m super excited about that! Thanks for sharing again! Michelle recently posted…Weekend Recap + Taper Time! I will be in Richmond too running the 8k since it is the week after NYC Marathon. I’m going with a group of girls from my running group….it will be so much fun! YES!!! Can’t wait to see you there – I’m so excited to head back to Richmond!